I’m walking down a path outside the centre, by myself strolling around, probably whistling, and I meet a man or woman or child: “Mangwanani,” I say. They respond “Mangwanani, marara sei?” I answer, “Ndarara mararawo,” and they respond, “Ndarara.” Usually this also involves a hand shake, or hand grasp really, with one shake maybe. It all takes about thirty seconds. If they greet me first, I’m the responder. The problem is that you must go through this rigmarole with every single person you encounter. Imagine walking down a busy sidewalk and stopping for a greeting ritual with every single person. And that’s good morning; it changes to good afternoon and good evening as the day progresses, and if you meet a group you can’t say hello to the group, you have to go through the routine with each individual. 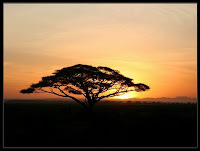 Africa teaches you to slow down, which is the secret of time. Whatever you’re rushing off to do, it’s not as important as greeting the person in front of you right now. I’m walking down a path, and I meet a boy about seven years old, one of the many children too poor to go to school and learn English. He has a ball he’s kicking made of some stuffing, grass or cloth or cardboard, completely covered in duct tape. It wasn’t very round, but he kicked it as he walked. When he stopped twenty feet in front of me, without a word I made a slight gesture with my head, and he kicked the ball over to me. I kicked it back as best I could. The day before I’d been laughed off the soccer field at the school because I couldn’t pass to my teammates. My stupid response was, “Wait till baseball season!” Now with this little boy I did better, blocking and kicking back, over and over. We played for at least half an hour then quietly went on our ways. I’ve never told this story because I don’t know what it means, but it has always stuck with me. The pastor of the little church where the beautiful hymns were sent up to the heavens organized a dinner in my honor. Sadza, like polenta, was served with vegetables and sauce. We honored guests also had delicious stew meat and gravy with our porridge. Outside there was quite a struggle over who was allowed to sit and eat with us and who was left out. My good friend, Israel Chisosa, a young teacher, and I talked vivaciously the whole time. It was a great party. Then I was formally thanked for my visit and more songs were sung. Every single person had to shake hands with Baba Pedersen afterwards. Many were worried because I was not married. They wished me many children. On the way home I was thoroughly happy, and I asked Baba Finster what meat we’d had that was so exquisite. “Don’t ask,” he said. “You mean it was goat?” I insisted. “They rarely eat meat. It was in your honor.” “What was?” I really didn’t get it. “That they killed the family dog.” Oh. After I left in 1975 the war got worse as independence loomed. My friend and host, Bishop Abel Muzurewa, was the peace-making leader of a transition government, before the oligarch Robert Mugabe (1979). The freedom fighters, drunk on homemade beer, came to warn the Finsters to leave. The Dendera Community Development Centre was taken over by the rebels as a base camp, and they destroyed everything there. Now nothing remains. Well, a great deal remains actually. I carry some around with me all the time. Mutt: Hmmm. A contest then, a duel? Jeff: And I’ll give you first strike. Mutt: You’re on. Acupuncture: a jab well done. Jeff: A chicken crossing the road: poultry in motion. Mutt: The dead batteries were given out free of charge. Jeff: Bakers trade bread recipes on a knead to know basis. Mutt: A will is a dead giveaway. Jeff: A boiled egg is hard to beat. Mutt: You win. I give. Uncle!!! Jeff: Nix, Mutt, nix. A gentlemen’s draw. 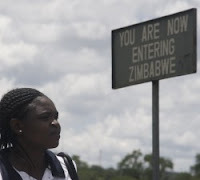 Zimbabwe is suffering: AIDS, inflation, hunger, dictatorship. It was when I was there too, thirty-five years ago. In 1975 I spent a long summer in the Mtoko Tribal Trust Area (Chief Johnny Mtoko’s land), in the northeast corner (of then Rhodesia) near the Mozambique border at a place called the Dendera Community Development Centre. It was run by a couple from Sacramento, California: Bill and Esther Finster. Bill was a forestry manager hoping to bring back the trees that the locals cut for firewood, a losing battle in a desperate, parched land. At the center we had a clinic (with a nurse and an aide), a church, an adult literacy program, and an agriculturalist teaching farming/gardening in perpetual drought conditions. There was a reservoir that, in the dry season, women would walk even 25 miles to use, sleep overnight on the ground outside our house, then carry a jug of water home on their heads another 25 miles home. The precious water was infected with bilharzia, a parasite. Across the big pond there was a public school. Since it cost a dollar a year to send a child, most families could not afford it. They had no income. And there was a civil war going on that was a decade old. We heard fighting nearby, but our center was protected by both sides. Probably because we treated both government soldiers and freedom fighters at the clinic (I was told to stay away when they arrived). For civilians I drove the ambulance (a right-drive Land Rover) on the long trip (about 4 hours) to Nyadire Hospital along the main A2 highway, a horrible, non-maintained dirt road, while another driver named Joseph would drive the smaller roads and trails around our area to pick up people because the roads were mined by the guerrillas, and Joseph knew where the mines were. I helped Bill and Esther (Baba and Amai). I boiled oil drums of water. I tended to the chickens, fast little devils. I gathered the pawpaws. I washed clothes on a washboard and took showers outdoors from a sort of watering can on top of a ladder. I drew posters for the nurse to teach mothers how to keep their children alive. I recorded the beautiful singing of our friends who gathered in our living room after curfew (risking arrest). I unpacked barrels of books donated by the Americans and made a library. One day I was supposed to meet with the school children, and I was very punctual (naturally), whereas their teacher was an hour late. So while waiting I grabbed a picture book from the new untouched library and read to them. It was a popular book among American kids: The Bear’s Christmas, all about snowmen and reindeer. The African kids seemed to enjoy it, all sitting up close and staring wide-eyed at the pictures (I couldn’t tell how much English they spoke; their native language was Shona). I ended with the usual, “Any questions?” and one brave soul asked, “What’s a bear?” Oops. I tried to explain. A furry animal big as an ox that lives in the forest. “What’s a forest?” Um, a bunch of trees, big trees. And then the killer question: “What’s snow?” The teacher arrived and saved me from further embarrassment. Baba Finster had built all the buildings in the complex himself, including their small farmhouse with a kitchen table next to the window with yellow curtains. The people that Amai helped as she could would sit on the ground right outside that window. Women and their nursing babies mostly. They would not beg or demand, just sit there. Hungry. Starving. Watching us eat. Every day. We had simple food, much of it canned (no fridge), fruit for dessert, orange squash and coffee. We saw the starving, dying people a few feet away and ate our meals while trying to get radio reception (it came and went) for our only contact with the outside world. We ate so we would be fit to continue helping these gentle, warm folks. They all have names, you know, all those babies that die. Their families love them all and cry at their funerals. The Shona are good, kind people who just don’t have resources. I was eager to do something important at Dendera so Baba showed me the closet full of weird stuff sent from America. One thing struck me: a volleyball and net. He said skeptically, “You want to set it up? Go ahead.” I worked with Thomas the handyman to set up two poles and boundary lines, all measured precisely. 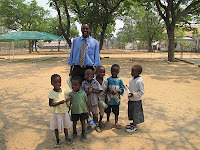 Then I pumped up the ball, and, in the evening, after the clinic and school closed, I invited everyone to come play. I showed how to serve and hit, but the Africans were not bothered by regulations and technique; they liked to have ten on a side (or fifteen) and just hit the ball around and laugh. Keeping score became unimportant or impossible. I saw all these friends, who had lived in hardship all their lives, come every evening before sundown to play a chaotic volleyball game. The shouts of joy could be heard all around the complex, but we also heard bombs, grenades and gunfire from over the copse. Sometimes the nurse excused herself to go treat an injured fighter. The Shona lived in a country at war with itself (1965-1980). Nothing could stop that, but volleyball did raise a smile. A bizarre normalcy. I had virtually no contact with the ruling white minority during my time spent in the tribal territory. 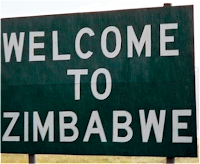 I only drove through Salisbury (now Harare) on my way to the airport. I experienced a lot and learned a lot. I gave away most of what I brought from home (a frisbee, a flashlight, a harmonica), but I took with me a lifetime of lessons learned in only 3+ months. Maybe being there for a short time clarified the events for me; after 30+ years in Sicily almost nothing is clear, and I feel I have almost nothing to share about this culture. I’m not the sociologist in the family. So what were these great lessons I got from this enchanting, unlucky, once-glorious people, the Shona? 1. Know your context. 2. Look after yourself, then others. 3. Find a reason to laugh. That’s kind of a phony list of platitudes. You can do better. We don’t need the slogans, but we do need one another’s stories. And we need to meet others to know ourselves. So, young people, go to college but also go to Africa and say, “how can I help?” Once the great continent’s healthy again, it will teach us all about how to live. 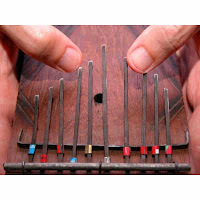 I’ll put some of my field recordings from Dendera, Mtoko, Zimbabwe on Martin’s Moan and Drone. Jeff: Uh, oh, here it comes. Mutt: That the roundest knight at King Arthur's round table was Sir Cumference? Jeff: Jolly good, old chap. Did you hear about the butcher who backed up into the meat grinder and got a little behind in his work? Mutt: No. But I did hear about the dentist and the manicurist who fought tooth and nail. Jeff: Nix, Mutt, nix. I heard that when the smog lifts in Los Angeles, U.C.L.A. Mutt: Oowah! I heard that when a clock is hungry it goes back four seconds. Jeff: Please stop, for the love of Mike. My calendar's days are numbered. Who’s Mutt and Jeff Anyhoo? By 1915 Mutt and Jeff were a national phenomenon. Many people consider "Mutt and Jeff" to be the first daily comic strip. Mutt was a tall, lanky man with a penchant for the ponies, while Jeff looked like the Monopoly man after a rough weekend. Mutt and Jeff were affable losers -- the guys in the cheap seats at horse races on a Wednesday afternoon. 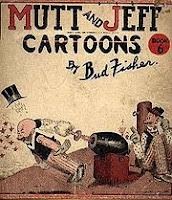 Characteristic catch phrases used by Mutt and Jeff included "Nix, Mutt, nix! ", "For the love of Mike!" and "Oowah!"" Many years ago I lived alone in a shack by a canal. The plaster was rotting and the mould stinking so I usually left a door open when I was inside the one room kitchen-bedroom-study. There were two cats from the neighborhood who would walk into my house like bored housewives in a shopping mall, stroll around, sit a while, eventually traipse off till the next day. I called them Mutt and Jeff. I talked to them often. Maybe they understood English, or maybe they thought they could pick it up from listening to me. Then one spring day a tragedy occurred. Mutt and Jeff, my only two buddies at the time, were in front of the shack where I could see them through the glass door, and what they were doing shook me and shocked me. Jeff was on top of Mutt (or vice versa) from the rear biting his neck and they were both screeching in intense pain, wiggling to get free, and ecstatic. I finally realized that one of them was a female and felt so strongly “in the mood” that I could smell it through the closed door. I’m not sure which, since I could never tell them apart. I bet they knew which was which. I hate Mutt and Jeff. They always criticize me and make fun of me. I wish they’d leave me alone. I’m very sensitive and can’t take it anymore. At least they don’t listen to my songs on the other blog (Martin’s Moan and Drone), or there’d really be some hooting. A punster entered a local paper's pun contest. He sent in ten different puns with the hope that at least one of the puns would win. Unfortunately, NO PUN IN TEN DID. Ha, ha. Now that’s funny. Get it? No pun in ten did. Talk to us, you old grouch! We who loved J. D. Salinger’s books passionately are sad, of course, that the old man’s finally died, but we’ve carried around for decades a sort of ambivalent admiration for his reclusive resistance, a model non-conformism with ourselves as victims, mixed with a longing for his voluntary muteness to end so that we might once again hear our favorite songster hit the high notes. In the late sixties—that era of youth being youth (living like there was no tomorrow, against all parents and pigs), loud colors, assassinations, moonshot triumph and Vietnam debacle—I survived adolescence (without finding the sense in it, however) thanks to Salinger, Steinbeck, Vonnegut, Brautigan, Tolkien, Conan Doyle, Herbert, Saroyan, Fleming and Thurber. There are others that don’t come back to mind after forty years, but these writers kept me going; I systematically read every book they wrote. I’m sure high school would have been dreadful anyway, but it didn’t help that I was almost two years younger than my classmates. The girl sitting next to me in sophomore English dropped out of school because she got pregnant, while I asked myself what precisely that meant and how it was accomplished with no answer forthcoming. I bought my copy of Catcher in the Rye at the Salvation Army Thrift Shop. It was covered in butcher paper and tape, still a banned and shameful book in many places. The thought of someone hiding forbidden-nastiness with fifty strips of scotch tape was hilarious and pathetic. I left the paper on and read Catcher again and again. Then I graduated to the Glass family books, which I liked even more. In 1997 my dear copy of Catcher fell off the trailer while I was moving and vanished. Wonder what the finder thought. They say that Jerry has been writing all this time. When will we get more (“want it, need it, gimme gimme gimme")? Times have changed; I’ve changed, could be a colossal letdown I suppose, yet I believe I will enjoy the next Salinger book more than just about anything. After all, I liked Cat Stevens' new record (Yusuf Islam, An Other Cup). Mutt: I wondered why the baseball was getting bigger. Then it hit me. Jeff: Let me tell you, if you jump off a Paris bridge, you are in Seine. Mutt: Oh yeah, well if you don't pay your exorcist you can get repossessed. Jeff: Okay, show me a piano falling down a mine shaft and I'll show you A-flat miner. Mutt: Well, when you've seen one shopping center you've seen a mall. Jeff: And not only that, you’re stuck with your debt if you can't budge it. Mutt: Y’know, we should be on TV. Jeff: Hell, we should be on Mount Olympus looking down. Mutt: Don’t forget: when two egotists meet, it's an I for an I.